Lorna Fitzpatrick will be the USI's next president. 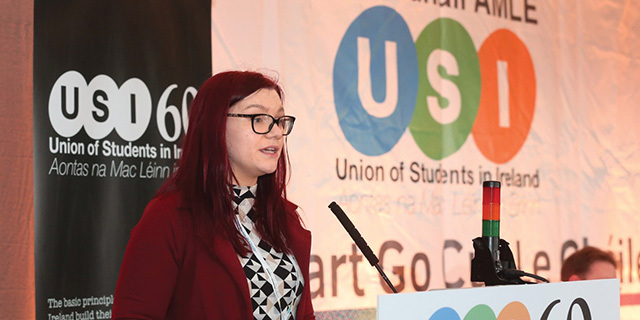 Lorna Fitzpatrick has been elected as the next president of the Union of Students in Ireland (USI) at the Union of Students in Ireland Congress in County Mayo. The Business and Human Resource Management graduate is currently the USI Vice President for the Southern Region. She previously served two terms as President in IT Carlow Students’ Union as well as being the Deputy President for Welfare & Education for a year. “We are facing issues such as accommodation, access to higher education, higher education funding, ending direct provision, climate change, social justice issues in Northern Ireland alongside Irish language rights,” she said. Out of a total 211 votes, Fitzpatrick received 121, her opponent Oisín Hassan received 88 votes and Re-open nominations (RON) received one vote. Her term will be beginning on the July 1st and she will be working alongside newly elected Dublin Region Vice President, Craig McHugh who received 69 votes against RON which got four votes. Michelle Byrne, who was elected for a second year as Vice-President for Campaigns won by eight votes. Kevin McStravock won the role of Vice-President for Academic Affairs and Róisín O’Donovan was elected Vice-President for Welfare. Megan Reilly was elected Vice-President for Equality and Citizenship, taking over from Aisling Cusack in the role. Marie Lyons was elected uncontested to the role of Vice-President for the Border, Midlands, and Western Region, with Darren Malone taking over the role of Vice-President for the Southern Region. Sara Dowling secured the position of Vice-President for Postgraduate Affairs and Clíodhna Ní Dhufaigh was elected uncontested to the role of Leas-Uachtarán don Gaeilge. As well as elections, motions were discussed throughout the four days of the gathering. DCU proposed motions regarding Diversity in Leadership as they believe the representation of minority groups is struggling as well as second-hand smoke as they think campuses should have smoke-free zones. On day two, Technological University of Dublin’s SU (TUDSU) left the Congress floor together due to their proposed motion regarding the cap on USI affiliation fees being canceled out by current USI president, Síona Cahill’s proposal for Affiliation Fees Review. With threats to leave the union, Trinity College Dublin’s SU supported TUDSU whilst DCUSU were against it. TUDSU later reappeared for the discussion of autism awareness. However, their motion failed to pass as they weren’t there to vote on it. VP for Academic Affairs, Callaghan Commons and VP for Education and Placement, Craig McHugh were the only DCUSU sabbaticals to represent the union with Commons being the only newly elected sabbatical to attend the four-day event. And along with executive members and class representatives, they were awarded the best large delegation award of 2019 on the final night.